NB Commentary: Yeah, tell me about it. Here’s a question worth asking right now: What would happen if 150 armed Black Lives Matter protesters occupied a federal building? Meanwhile, also joining Bundy is Ryan Payne, an Army vet who claimed he organized militia snipers to target federal agents during the Bundy standoff in Nevada last year. 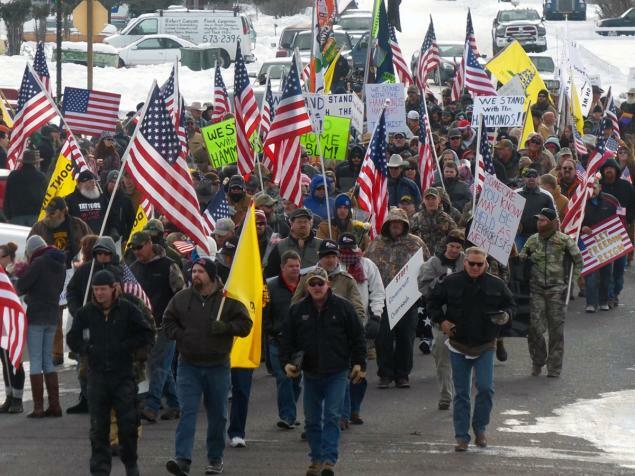 Political protest, which is free speech, is one thing, as was the original protest throughout Burns. 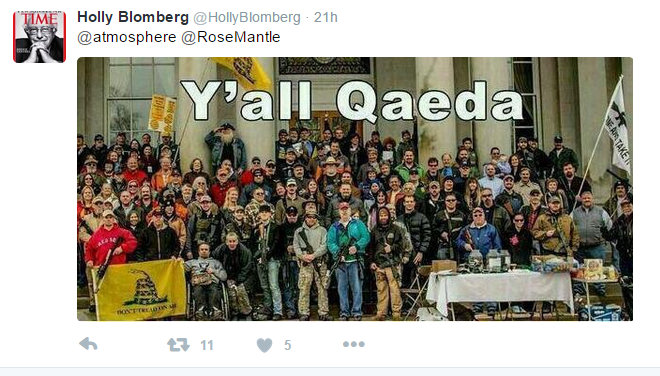 But when you and your boys get your guns, form a splinter group and take over a federal building, that is terrorism. And yet, law enforcement is taking a low-key approach to the whole thing. No national guard has been called in. Nothing to see here. Is this not the country that seeks to end terrorism? What is terrorism? The FBI defines terrorism as “the unlawful use of force or violence against persons or property to intimidate or coerce a government, the civilian population, or any segment thereof, in furtherance of political or social objectives.” J. Edgar Hoover terrorized the black community for years, so the FBI should be a dependable source. And yet, the working definition of terrorism does not apply in actual practice. Remember, in the U.S., whether it actually counts as terrorism depends on the skin tone and religion of those doing the terrorizing. 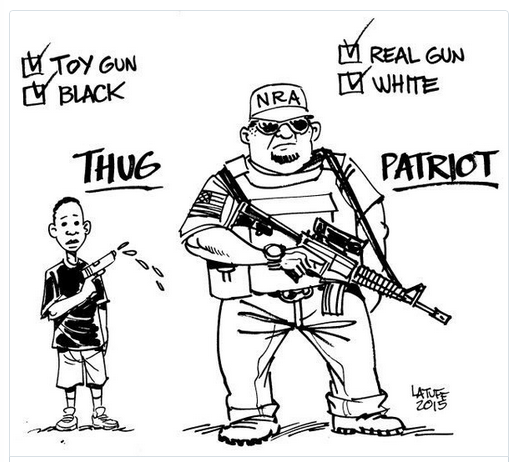 So, black and brown people are painted as thugs, gangbangers and terrorists, in a nation that has empathy even for white mass murderers, who are captured alive. Charleston shooter Dylann Roof—certainly a terrorist yet not called one—was even treated to Burger King on his way to jail, hours after the white supremacist had murdered nine black people at the Emanuel AME Church. This, in a nation that has declared walking while black an offense punishable by death, as unarmed black women, men and children are shot for no good reason, left to die in a pool of their blood. In the case of Oregon, the double standard of color coded terrorism speaks for itself. At least one CNN expert was honest and embraced the double standard. 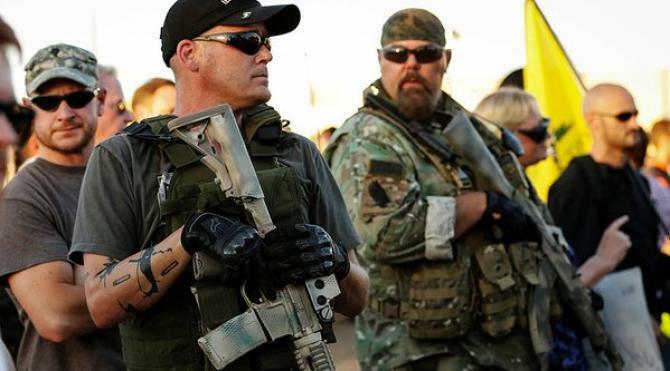 Law enforcement analyst Art Rodericksaid this white militia was not being treated like Black Lives Matter protesters or Muslims because they were not looting. Go home? If Black Lives Matter protesters were to take over a federal building, armed to the teeth with firepower–and they certainly would not do this—they would wind up dead, or in prison for life on terrorism charges. And it is almost fitting that Oregon provides the backdrop for this latest case of white domestic terrorism. Known for its violent history of oppression against Native peoples, Oregon was established as a white racist utopia. It was the only state whose founding constitution forbade black people from living within its boundaries, which was the case until 1926. And today, Oregon is only 2 percent black. Meanwhile, America is no stranger to white domestic terrorists. For African Americans, the Ku Klux Klan was our ISIS. They were praised in the White House, and controlled state governments throughout the country, including Oregon. We faced the lynching and firebombing, and the aerial bombing of Black Wall Street. Even today, black people fear for their lives, as America normalizes the violence against them. This, as angry white men–uneducated, disaffected and wanting to “make America great again”—threaten to use their guns, their only manhood, against their perceived enemies. But white terrorists are not taken seriously, because (white) boys will be boys.